I have the itch to do some cold smoking. I'm especially looking forward to salmon and trout. Cold smoking is simple; it's simply a process of bathing food in smoke but in the temperature range of approximately 10 deg above ambient to not more than 110-deg-F for a long time (18-24 hours). Therein lies the challenge. Finding a cheap piece of equipment (because I'm frugal) that can maintain a constant low temperature for at least that long is no small trick. I took an old Weber Kettle I had from the trash and removed the bottom mechanism to permit the bottom vents to stay full open. 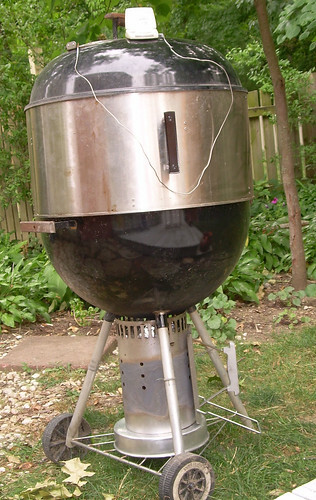 I hypothesized if I could get the heat source below the kettle (rather than inside), I should be able to waft the smoke into the kettle keeping the temperature inside the kettle cool enough for smoking. In order to keep the cooking surface as far from the heat source as possible, I affixed a Thunderbelly stainless collar to my kettle (the cooking surface is on top of this collar). Then I used my starter chimney and built an 8 briquette fire in it, tossed in some mesquite shavings on top of the briquettes and shimmed it up close to the bottom of the kettle. In this configuration, the heat source is approximately half way in the chimney which serves to deliver the smoke to the bottom vents while most of the heat dissipates to the surroundings. Monitoring the dome with a thermocouple inserted (with the vent full open), a temperature of approximately 95-105-deg-F (ambient temp 80-deg-F) was achieved for hours! Unfortunately, I could only hold this temperature for ca. 6 hours. Then, I'd have to charge more fuel and this would be annoying in the timeframe required for this process. Overcharging the chimney would likely result in too much heat generated. This rig needs to be rock stable for at least 18 hours and since it's a long time, it also needs to be nearly maintenance free - I don't want to have to go out in my yard in the middle of the night (to fight a racoon). In my next attempt, I'm going to use a hot plate and cast iron skillet to smoke wood pieces below the chimney. I'll still use the chimney as my smoke conduit. A good first attempt, but I'm now waiting to find a hot plate at the thrift store. Keep you posted. Where can one get the Thunderbelly stainless collar? The link provided takes me to a page where there is no buying info. I couldn't find a "buy" button anywhere on it. Try to find contact information on the page or sign their guestbook. The page was updated, it says, Oct 09.